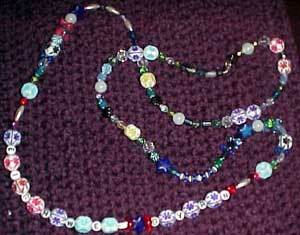 I just put up a web page with links to photos of a lot of my craft stuff (beading/wirework/crochet). I'm still working on it. Suggestions and comments welcome. I like the star cluster! I found that I get really good 'photos' of my beadwork by laying it right out on the scanner, and scanning it. Cameras often don't do the detail justice, though your close-ups are pretty disctinct. Oh, cool, I'll definitely try that. Just one warning: There is a mistake in the instructions. I'll try to find the magazine later tonight and let you know exactly which step it's in. Corrections to "Woven Star Clusters"
Also, Figures 6 and 7 show a size 8 bead in the very center, but there are no instructions for putting one there. It's easy enough to put one there between steps 4 and 5, though. Re: Corrections to "Woven Star Clusters"
I also sent the corrections to the magazine's editorial department; we'll see if they appear in the magazine's corrections web page. Good idea.... it will be interesting if they publish the corrections. I succeeded in making one.... even varied the beads and it still worked.... thanks to your correction.... I will probably post it in beadwork later when I've had a chance to get a picture. The instruction for putting the bead in the centre is in step 8, only they use an A bead.... which the ones on the next page have. Looks like it wants to be http://www.cat-and-dragon.com/stef/pix/jewelry/ednecklace.jpg. Would you rather be identified in some other way as my teacher for Byzantine Chain? Nah, I'm not feeling picky today. If you'd prefer to use my real name or anything, feel free. Thanks for checking.